So hey, remember last week when I went to great lengths talking about how season three’s biggest problem was its lack of effective tension? Yeah, I’m regretting that now. Not because I think I was wrong, or that I’ve changed my mind, but because it means I’m going to end up repeating myself today. “Novus Ordo Seclorum” is not a very good hour of television. It’s not the worst episode the show has produced, but it fails to generate any real suspense or concern, despite all efforts to the contrary. There are events here which should be momentous, reveals that should intrigue us with future possibilities, sacrifices that should wrench our hearts. And yet it all feels rather middling. The sense that everyone is simply going through the motions is hard to shake, and no matter how often our heroes talk about facing off against a god, or the impossibility of their task, the threat itself doesn’t make any significant impression. The danger is never more than theoretical, and without that danger, the story itself can’t hold up. 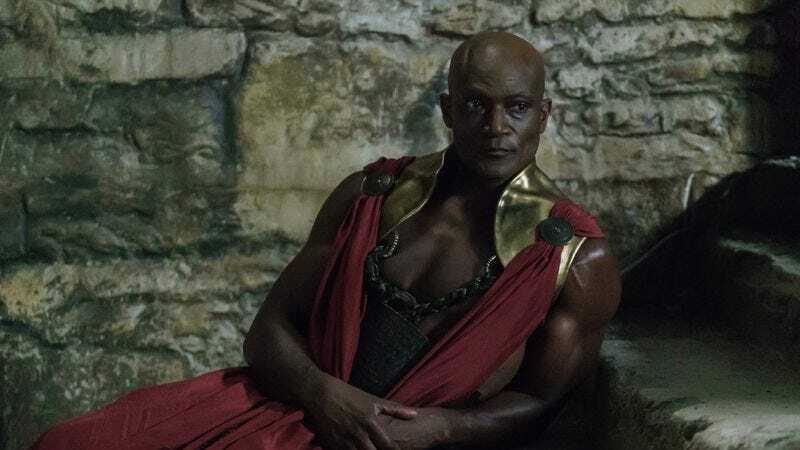 About that god: Pandora, it seems, has spent the the first half of this season growing doom flowers on a tree so she could summon her lost love back to life, an ancient god whom Ichabod names “the Hidden One” (Peter Mensah). That’s a fairly generic name, god-wise, but it’s translated (from “Etu ‘llu” I think), and it’s vaguely evocative in a non-specific way, so let’s give it a pass. He doesn’t get a chance to make much of an impression. There’s some talk about how he’s disgusted with the modern world, how everything has changed and is now tainted by the corruption of human life, and that’s potentially interesting. But most of his time time is spent draining Jenny of her Eye mojo, and when it comes time for the big show-down, he’s not a particularly imposing threat. Sure, he has some moves, but nothing he does here seems much more dangerous than anything Ichabod and Abbie have already faced. Moloch, this guy is not, and even Moloch turned out to be pretty unimpressive in the end. Still, this hour is so empty that it’s hard not to feel cheated by it all, cheated that the rising action this season has petered out into a climax with no real monsters (sure, Pandora and the Hidden One aren’t really human, but they look human, which diminishes their monster quotient considerably), and a “sacrifice” which fails to convince in any way. Abbie carrying the shards of the Shard into the tree barely even makes sense, but if anyone of the writers legitimately believe people are going to think she’s dead, I feel kind of bad for them. And worried about the show’s future. Abbie getting trapped in Purgatory? That felt legitimately unsettling, because while we know she isn’t going to die, Purgatory itself was an unsettling place. Inside the tree is just conjecture right now. Instead of being concerned for her safety, I’m annoyed that the show is once against splitting up its two leads, and robbing us of the chemistry that makes the rest of the nonsense generally watchable. I’m getting ahead of myself, though. The majority of the hour is spent with Abbie, Ichabod, and Joe trying to track down Jenny and her captors; then, once they realize who Pandora has brought through, they scramble for an edge to defeat their enemies, and some way to free Jenny of the curse of the Eye. All of which sounds like it should provide the materials for a thrilling good time, but the result is some drab flashbacks (man, remember when the flashbacks were actually fun? ), a joke about a toga party, and a lot of foolishness with Agent Reynolds and his case against Atticus Nevins. The cop stuff on this show (FBI stuff now, really) has never been convincing, although that hardly matters. It just needs to be fun, and tonight was not. Watching Agent Foster try and lecture Nevins into confessing was an unnecessary repeat of a scene that’s been down hundreds of times before elsewhere, and nearly every scene at the FBI offices felt slow and pointless. Abbie turning over her badge and gun should’ve been a big moment; she’s potentially sacrificing the career she’s spent her life building to save her sister. But really, it’s just frustrating how long it takes her to get there. All of this tedium pales in comparison to the actual climax itself, which is as lackluster as one might expect after what came before it. Our heroes go on and on about how dire their circumstances are, but when it comes time for the showdown, the danger is brief and unimpressive. Technically, the good guys are struggling, but the struggle is just so mundane. Ichabod’s attempt to bring creatures out of Pandora’s box is a clever idea, but the sight of both characters chanting intently as the silver box spins between them is borderline laughable, made all the worse by the fact that, so far as I can tell, nothing happens. 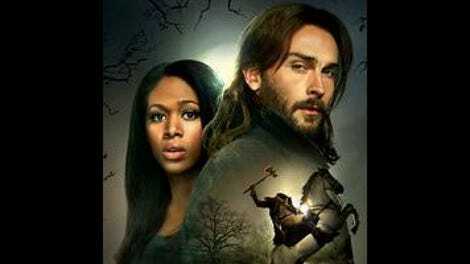 Ichabod runs after Abbie, leaving Pandora behind, and the magical blast that hits the room destroys the box, although Pandora and the Hidden One are nowhere to be seen. While it’s proper that the villains should escape to plot another day at this point, the storytelling here is so haphazard that it looks less like an intentional twist, and more like whoever was in charge just forgot to wrap things up. Nothing should be resolved in a mid-season finale, because it’s not really a “finale” at all; just a pause with enough of a hook left to pull you back in the new year. But while “Novus Ordo Seclorum” has all the necessary materials for a cliffhanger, the execution is lackluster and frustratingly lax. Modern Things Of Which The Hidden One Does Not Approve Of This Week: He’s not big on the air, the water, the light, and the human race. “Don’t let anyone in too close. When you lose them, it’ll break you.” On the one hand, Paul Revere had just lost a son. On the other, this was such an out of nowhere attempt at serious drama that it was borderline hilarious. Agent Reynolds is apparently working on some secret project to cultivate Abbie as an asset for something. Pandora: bulletproof, but vulnerable to tasing.